In Angkor just say "bonjour"
Forget Lara Croft. Wildly adventurous stays but with a touch of colonial luxe. Angkor temples guide, shopping, golf, Siem Reap nightlife – and how to beat that infernal tourist traffic. 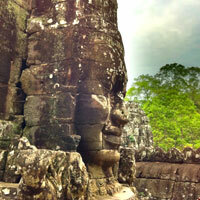 Giant stone faces grace the Bayon Temple walls behind a monk in saffron robes on his morning alms rounds. The Angkor temples transport visitors to another world of twisted roots, architectural devotion, and majesty. A SMALL crowd has gathered behind me at the bar. I am sipping an ice-cold Angkor beer and scrolling through my best photos of the day. I just happen to have stopped on a rather moody shot of the sun rising over Phnom Bakheng. Big deal you might say – just another temple snap. But my photo is remarkable. There are no tourists in the frame. People describe a visit to Angkor Wat as an Indiana Jones adventure and that is true on many levels. You will indeed clamber through misty jungle vines and over ancient ruins but you’ll be searching for another kind of Holy Grail. Forget tatty old cups – the sacred prize here is a tourist-free temple experience. If you’ve managed to photograph a temple unblemished by scrambling camera-waving crowds – expect questions, a lot of them. Which temple is that? What time did you get there? Which gate did you enter through? 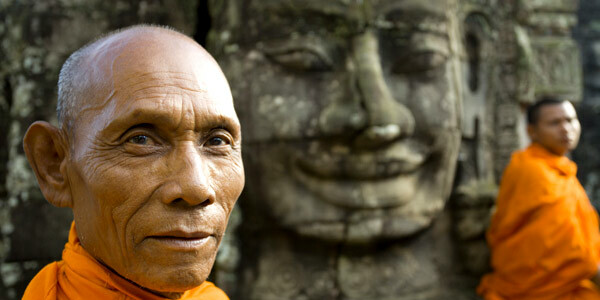 The search for peace is a Siem Reap obsession. Los Angeles has its crystal meth, here it's crowd dodging. People huddled in cafes furtively swap information, maps splayed and pens scribbling. Saunter past their table and the whispers will halt abruptly. Unless you have a hot tip to peddle – you’re just another temple hogger. But if you’ve got a photo like mine, pull up a seat and let the insider trading begin. 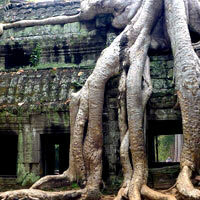 Get the low-down in our Angkor temple guide section. You might successfully dodge a crowd of snap-happy Japanese holidaymakers, but you definitely won’t escape the attentions of the army of children who patrol the temple perimeters selling scarves and postcards for, you guessed it, “one dollar.” While the constant barrage of “What your name? Where you come from” is likely to drive you nuts, you can’t help but be charmed by their sharp wit and, at times, hilarious banter. I came across one hapless tourist crossing swords with a cocky eight-year-old girl. “You buy bangle for your wife?” “I don’t have a wife.” “You buy bangle for your girlfriend?” “I don’t have a girlfriend.” “You don’t have girlfriend because you not buy bangle.” Classic. Cambodians are a proud and battered folk, not a mendicant pushover people, most especially not in Siem Reap, the pleasant if dusty market town, once distinguished only by its Royal Residence, that has become the tourist dormitory to the great Angkor temples complex seven kilometres down the road. Nowhere else in Cambodia do locals have to get used to foreigners at such density per square metre. Such is the accommodation boom that it is as though all the major hotels in Hong Kong had been squeezed into Zuhai. Siem Reap hotels have mushroomed to the point where finding walk-in space at a decent address jet-fresh from Paris, should not pose a problem. This imperfect, and noisy, complements the myriad Angkor temples on display in the steaming rainforest. Herewith our Siem Reap and Angkor guide for the uninitiated, from heritage hotels to bars, restaurants and, yes, a smidgen of nightlife. Although small, Siem Reap airport is an attractive introduction to the city with huge windows looking out over lotus ponds and lofty palms. With stone statues dotted around the place and contemporary Khmer art on the walls, it could teach some of the city hotels a thing or two about decor. Angkor Wat is protected by a law that allows only small planes to fly close to the fragile temple complex. Tourism has boomed in recent years with the rise of budget airlines and the current airport is being expanded to make room for more flights. The prospect of thousands more tourists arriving could put an end to solitary temple moments for ever. Go now before Starbucks and McDonald's beat you to it. A visa on arrival is US$30 and is valid for one month. Some travellers don't require a visa and it is advisable to check before entering the country. Bring a passport photo and watch in wonder as your application whizzes along a line of about 15 crisply uniformed officials before being returned to you in the blink of an eye. You can now get an e-visa (www.evisa.gov.kh/) in advance for the slightly inflated price of US$37. If your hotel is not meeting you, head to the friendly taxi counter out front and pay US$7 for the 15-minute journey into town. If you’re travelling light you can hop on a motodop (moto-taxi) for US$2 or stroll into the car park opposite and negotiate with one of the tuk tuk drivers. Expect to pay around US$5 to the city centre. Extra charges may apply for hotels located outside of the main town area, however, most hotels would offer free airport pick-up. You could also do a roundtrip to Phnom Penh with a car and driver. At around US$70-$100 a trip, it is quite a cost cutter if there are two or more, taking four hours over splendid roads that show off the countryside. For a short leg stretch, stop by the town of Skuon in Kampong Cham and have a taste of the town's famous fried tarantulas served on a silver tray, stacked up in a mountainous heap. The price of two spiders is $1 but if you simply can't stomach it, the vendors will be more than happy to pose for a photo. Cambodia informally runs on US dollars with an exchange rate to Cambodian riels of US$1=KHR4,080. That means that pretty much everything from a Coke to bangles and beads costs at least a dollar. Keep plenty of US$1 bills on you and do not bother to change money into riels. You will accumulate enough of those in return change. Ask for the price in riels if you want to pay less for simple things like bottled water or light snacks from street vendors. Extra riels are also useful for tips. Tuk tuks swarm through the streets and are the cheapest and fastest way of getting around. You’ll pay around US$2 per tuk tuk for trips around town or hire one for the day for around US$15. Drivers would rather be hired for the day and are more than happy to wait around for hours outside temples, restaurants and bars. The tuk tuks here are small but comfy cabins pulled by motorbikes or scooters. When choosing your driver consider his English skills and local knowledge. A clued-up tuk tuk driver will help you on your Lara-Croft mission to beat those pesky crowds. Siem Reap is incredibly dusty so you may want to wear a face mask or scarf while you’re motoring around unprotected. If you’re heading off before sunrise in the winter months, take a jumper. For a friendly and reliable driver try Soryean (tuktuks.weebly.com) who will supply you with bottles of cold water, hand towels and a face mask. The more adventurous might consider taking a motodop (moto-taxi) – you’ll pay about 2,500 riels (50 cents) for a short journey – while sporty folk might hop on a bicycle. You can hire one for about US$2 for the day although you’re likely to end up a dust-coated sweat ball after a few hours of pedalling. Taxis, usually a swanky air-conditioned Toyota Camry with a driver, are arranged – rapidly – through the hotels for around US$25-$30 for a day, or $15-$20 for a half day. As always, establish all charges before the hire starts and you will usually find the experience quite uncomplicated. 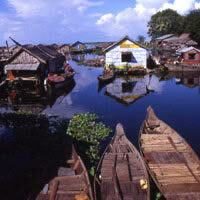 Tonle Sap lake is located 15km south of the town, about 20-30 minutes away. Its unique ecosystem and local communities offer a distinct sidetrack from the temples and busy town area. It is also a wonderful option for the more intrepid who have time to spare and want to take an alternative route to Phnom Penh or Battambang. Boats run between March and July during the wet season when the river floods and actually reverses its course. Transport is not the best, so be prepared for breakdowns which, surprisingly, are often fixed in a jiffy. The views are unbeatable. Find a seat on the open deck and enjoy the tranquil ride passing through pockets of floating villages and fishing boats. Be sure to slap on sunscreen while you're at it. There are boat services to Phnom Penh (US$35, five to six hours, departing 7.30am) and Battambang (US$20, four to eight hours, departing 7am). Tickets can be purchased through your hotel. The Kingdom of Angkor retains a certain mystic aura. 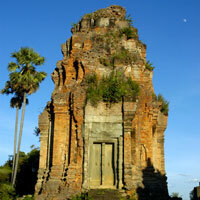 The Khmer kings were prolific temple builders. Having assumed the mantle of deva rajas (God kings), a concept imported from India, like the Pharaohs they constructed spectacular monuments to drive that point home – and inspire their subjects. Thus, the Angkor temples will, of course, be the centrepiece of your visit. More information at Tourism Cambodia (www.facebook.com and www.tourismcambodia.com/). If you want to avoid hundreds of tourists pretending to hold temples in the palm of their hands for Facebook photos, avoid the well-trodden tour bus routes. This tends to be sunrise at the west gate of Angkor Wat then late morning at Angkor Thom, Ta Phrom and Banteay Srei, then back to Angkor Wat after lunch with a final sunset visit to Phnom Bakheng hill. These places should all be on your itinerary but try it in reverse. Choosing your entrance point is also important. In the mornings, most groups arrive at the west gate of Angkor Wat so try the quieter east gate. Angkor Wat was built by Suryavarman II in the mid-12th Century. It is a vast complex. Expect to walk (and bake) a fair bit. A sunhat is a must. A long carving depicting the mythological churning of the oceans is on the east wall. Also try entering Banteay Kdei from the rarely used south gate at around 4pm then experience the last of the afternoon sun in nearby Ta Prohm, now overrun by the jungle and giant probing roots. By late afternoon the crowds should have moved on. Watching the sunrise over a temple is a memorable sight. The crowds thin out between 9am and 10am when the tour groups head back to their hotels for breakfast and likewise again between 12.30pm and 2.30pm when they go for lunch. Sunset is best experienced from one of the smaller temples such as the blushing red Pre Rup. You’ll be walking and climbing for hours on end so wear comfortable shoes. The young Korean woman we saw in heeled boots wasn’t having much fun. The Angkor temples feature steps that are both high as well as narrow, so tread carefully and never lean back. You will need to use your hands so backpacks will be easier than shoulder bags. You’ll also need to respectfully cover your knees and shoulders if you want to climb Angkor Wat’s central tower. If you intend to spend several days temple-hopping then maybe invest in a tour guide for your first day. A copy of Kenneth Cramer’s Siem Reap Angkor Visitor's Guide will prove useful. Mix in a day trip to a floating village or a scooter tour of the countryside. Just ask for a three-day temple pass with non-consecutive days. If time is an issue, consider a shortlist. In our brief Angkor temple guide, in addition to the aforementioned Angkor Wat and Ta Prohm, we’d recommend Angkor Thom, the walled capital of Jayavarman VII (the greatest of the Khmer deva-rajas) that has as its centrepiece the enigmatic Bayon Temple and its "mountains" of large stone heads. Also visit the rambling monastery of Preah Khan. Those staying in Siem Reap for a little longer should definitely explore out-of-town temples such as the delicately carved Banteay Srei (35km away) and the enchanting tumble-down Beng Melea (40km). The drive out to these temples is through lush rice fields, past old houses on stilts and kids swimming in roadside puddles. It will take between one and two hours in a tuk tuk and is a great way to see the countryside with the wind, dust and bugs in your hair. From US$10 guesthouses to sprawling five-star resorts, Siem Reap has an ever-growing legion of hotels offering everything from bespoke boutique experiences to luxurious tropical retreats. The airport road (National Route 6) is littered with new Khmer-style clone hotels but if you’re looking for something with more character, check out the bustling French Quarter. The second major artery that passes Route 6 at the central T-junction and heads to the Angkor complex has its share of better quality digs. Due to the large number of Japanese tour groups many hotels have Japanese-speaking staff and Japanese food. As a rule, meals in most Siem Reap hotels are decent and clean though take care over the water. Assume it’s not safe unless the hotel has a sign telling you otherwise – even then you may choose to ignore it. Most hotels offer complimentary bottled water in rooms. Watch out for the 10 percent government tax and the 10 percent service charge double whammy that lurks to trip the unwary. The spate of new hotels means travellers can push rates down 30 to 40 percent on any quote and, in the wet low season, significantly more. Also check booking sites online and you will find prices are less than half of the published rates. Sofitel Angkor Phokeethra Golf and Spa Resort is one of the few hotels in Siem Reap to have its own welcome lounge (more of a cosy booth actually) at the airport so the pampering begins the minute you step off the plane. You'll be greeted with a cold towel (the first of many) and a bottle of water, then plucked out of the sticky heat and transported by air-conditioned minibus to the hotel. Your complimentary arrival drink may look like a martini but it’s actually chilled spice tea. The first word you'll hear at this French hotel will be bonjour (or bonsoir), always delivered with a beaming smile. The 238-room Sofitel is located far enough out of town to avoid the noise but is still only a five-minute tuk tuk ride away from the bars, restaurants and markets around Pub Street. 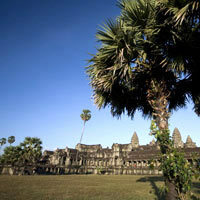 It’s also ideally located for sightseeing with Angkor Wat only 4km away. In fact, the only bad thing about Sofitel is it’s sometimes hard to drag yourself away from the sprawling pool when temple fatigue sets in. The grounds consist of seemingly endless stone paths and wooden bridges that wander through 60,000sq m of verdant gardens and across lazy lotus ponds. Pick one of the 80 Luxury rooms, each with its own balcony or terrace. Wooden floors, old-fashioned ceiling fans and tasteful period furnishings give each room an air of timeless colonial elegance while Khmer motifs remind you that you're in Siem Reap, not Paris. Rooms come equipped with TV, WiFi, laptop-size safe, minibar, bathtub, separate shower and L’Occitaine toiletries. Younger guests will be assisted by a children's concierge to make their stay as fun-packed as possible. Kids can also hang out in a breezy wooden pavilion called Villas des Enfants – a free kids' club packed with toys and games. Book a second room for children (under 18 only) and you'll get a discount of 50 percent. You can request a DVD player or Playstation 2 console and games. And the whole family can enjoy the nightly traditional apsara dances. After a long day exploring the temples, refuel at the Japanese teppanyaki bar or tuck into the daily Cambodian buffet on a garden terrace. There’s also a French fine dining restaurant, a live piano bar and an English pub. Sofitel also pulls in the business and corporate meetings crowd with imaginative packages including hugely atmospheric candlelit dinner extravaganzas near jungle temples. 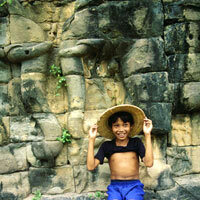 Or opt for a Cambodian Village Experience. Water buffaloes and monkeys will be spotted around the swimming pool but leave your simian friends behind if you’re heading to one of the five function areas including the Pokeethra Ballroom that holds up to 600 people. 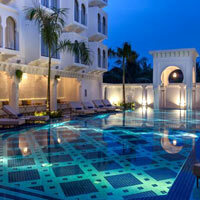 The Sofitel rates high as a child-friendly Siem Reap hotel and is versatile enough to manage conferences with aplomb. Another big attraction is the 18-hole, 72-par Phokeethra Country Club golf course with sloping greens and sweeping fairways. 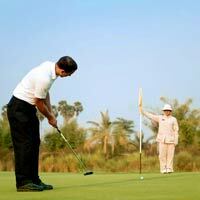 It is managed by Sofitel and is one of three golf courses in Siem Reap. 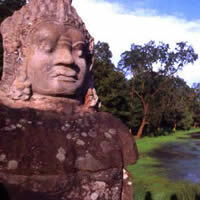 More in our Angkor guide to sightseeing and things to do, later on. Catch a golf shuttle bus from the hotel. You can also cycle to nearby Angkor Wat on one of the hotel mountain bikes then soothe pedal-sore legs with an Asian Blend rubdown at the spa. 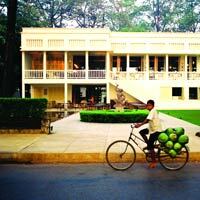 Next door is the 220-room Le Meridien Angkor. While it may look like a bland convention centre from the outside, inside it's all glass and marble in a simple Khmer style. Elgar plays in the lobby and there is a grass courtyard the size of a football pitch. The interiors are light and airy featuring temple motifs made from a palette of wood and ceramics. Rooms have timber floors and contemporary European furnishings mixed with flashes of local silk and stone wall engravings. Amenities include TVs, electronic safes, minibar and WiFi (US$2 per hour). Interconnecting rooms are available. Deluxe rooms also come with DVD players and aromatherapy oils. Deluxe room guests get the benefits of the Naga Lounge, which offers breakfast and free snacks throughout the day. Le Meridien’s size and functionality makes it a useful pick among Siem Reap conference hotels – find a 300sq m meeting room, board rooms, and business centre. The hotel also does off-site catering. Later, bathe like Suryarvarman II himself in the impressive Angkor Wat-inspired swimming pool or unwind in the elegant spa. A Khmer-style option in the vicinity is The Samar Villas & Spa Resort, an amalgamation of two villas, five junior suites and an apartment. Take your pick. The boutique-style address offers manicured gardens with an outdoor pool. As a family-run place, the pace is friendly and sedate. Expect lots of dark teak woods (especially across the floors), Thai-style red-tile roofs, smart sun umbrellas by the pool, and spacious neat uncluttered rooms with raised plinth beds again featuring lots of dark woody tones and Khmer artefacts. Several cuisines are on offer and for a relaxing afternoon, pick the Samar Spa with it's local Khmer massage and reflexology. An additional incentive are low season rates starting from US$81. A small caveat: Amex (American express) cards are not accepted in Cambodia. For some off-the-beaten track bliss, less than five minutes from the city centre, check out Heritage Suites Hotel. You'll probably think you're about to get your kidneys stolen when your tuk tuk driver turns off the main road and starts weaving through bumpy back alleys and past ramshackle houses, but its secluded location is part of this Siem Reap boutique hotel's charm. Next door is Wat Po Lanka and a small school so you'll wake up to the sound of children playing and monks chanting. The hustle and bustle of Cambodian village life dissipates as you step inside. More like a posh and modern colonial home than a hotel, the lobby doubles up as a lounge and bar with a wraparound balcony housing a stylish restaurant upstairs. The striking black and white interior includes wooden beams, antique lanterns and Cambodian art. The work of local photographers is inventively displayed on hanging cotton sheets that separate clusters of low-slung leather armchairs. There are only 26 rooms of which the most popular are the 20 suites, refurbished and relaunched early 2015. The 17 Bungalow Suites serve up 75sq m of space with outdoor showers and garden areas. Think lots of stretch space and light, neat timber floors, and ceramic pots and carved wooden furniture redolent of Angkor. The two Executive Suites provide the added luxury of outdoor Jacuzzis. If you really need to swing an elephant by the tail, opt for the 158sq m Red Poppy Suite in a minimalist modern Khmer style. Soak in a freestanding bath, get sweaty in your own private steam room or enjoy a chilled bottle of sauv blanc outside among the tropical blooms that wrestle for attention and space on the garden terrace. Expect a sun-dappled pool and a roaring fire pit on special nights. Snack on a Khmer burger and, later, the distinctly pink spa will revive temple-sore thighs. The philosophy of Heritage Suites is to offer a tailor-made stay. Staff are more than willing to go the extra mile to recommend cocktail bars and restaurants but they’ll keep their distance if peace and quiet is what you crave. Ask about their sister company Heritage Adventure, which organises bespoke activities from luxury jungle camping to quad bikes. If you’re scouting around for intimate Angkor boutique hotels with bags of charm and friendly staff – you’d do well to make a note of this name. Across the Royal Garden from the Royal Residence is The Raffles Grand Hotel d'Angkor, a restored grand colonial from 1932 with chequered floor tiles, the delightful original Otis cage lift that will need you to seriously tuck in your tummy, and a smooth understatement that goes with great self assurance. The old and rich prefer the original high ceiling wing and the nouveau riche, the new wing, a more svelte imitation of the old one, all around a vast, beckoning swimming pool. Rooms come with TVs, in-room safes, dual-line telephones, minibar, and WiFi is complimentary. Book one of the newly re-designed Cabana Suites if you want a private terrace and direct access to the pool. For more space and privacy spread out in the two-bedroom Villa or surround yourself with history in one of four Personality Suites inspired by people who have been closely associated with Angkor. Another highlight of this splendid property is the enormous swimming pool, which is simply irresistible. Also make time for the Asian barbecue buffet and cultural show held every Monday, Wednesday and Friday during the peak season. It’s staged in the gardens of the hotel surrounded by traditional Cambodian boundary stones and wooden gates. The evening show includes Apsara dances and Khmer martial arts and is hugely atmospheric. Head to The Conservatory lounge for free activities such as cocktail tasting on Saturdays and lotus flower folding on Wednesdays. As well as plentiful massage rooms, Raffles Spa has saunas, a Jacuzzi and steam room, plus there are two tennis courts and a well equipped gym. 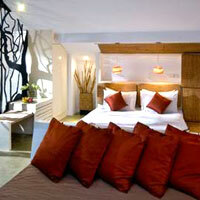 This is a centrally located and atmospheric address that rates high on our Siem Reap hotels review. Pick it for romance, honeymoons, corporate meetings or simply as a welcoming base for sightseeing. Run by the Vietnam-based Victoria Hotels & Resorts group, The Victoria Angkor Resort & Spa is a cosy and welcoming hotel with a charming shabby-chic style. The exterior is all yellow stucco and slatted shutters. The lobby is a cheerful mish-mash of colonial odds and sods. The mix-and-match decor creates the atmosphere of a relaxed and warm guesthouse while the facilities are definitely hotel quality. 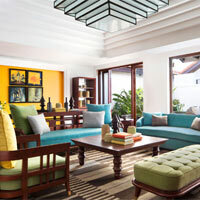 The sunny colour scheme extends to the 130 bright and breezy rooms furnished with bamboo cabinets and silk furnishings. Each offers open views from private balconies, TVs, IDD, safes, tea and coffee facilities, and free WiFi. There are 10 Colonial Suites and, for nostalgia buffs, three vintage Citroens are on hand for an evening spin (US$45 for a city tour). And, if you like to feel the wind (or perhaps stifling humidity) in your hair, mountain bikes are available for a pedal round town. 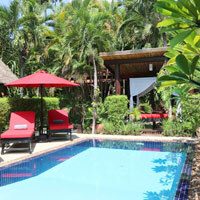 The pleasant pool is framed by tropical gardens and there’s also a small pond with crocodiles. Make sure you don’t dip your toes in the wrong one. Young guests can be entertained for free in the Kids' Club (daily from 7am until 6pm) while big kids can enjoy massages (sadly not free) at the spa. This is an interesting colonial-style retreat and a decent option if you're searching for family-friendly Siem Reap hotels. 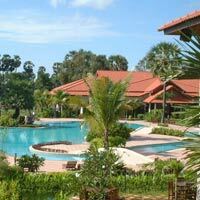 Another popular and sizeable address on this Siem Reap hotels review is the Sokha Angkor Resort, also on the airport road. During peak season you’re likely to find the lobby packed with chattering tour groups from Japan, Korea and Taiwan. The enticing temple-inspired saltwater pool (complete with tumbling waterfalls) gets busy late morning when the shutterbug hordes return from their sunrise excursions. The 276 rooms are unfussy yet comfortable with wooden floors, white walls and silk cushions in autumnal hues. The TVs offer cable channels (plasma screens in the suites), electronic safes, free WiFi, minibar, tea and coffee facilities. 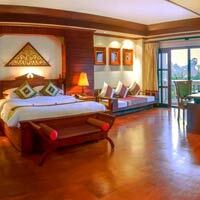 Pool-view rooms have balconies, while the Royal Sokha Suite has its own sauna and massage room. There are a myriad conference and event facilities, as well as three restaurants, two bars (including an Irish pub with live music and a pool table), a beauty salon, fitness centre, business centre, and The Jasmine Spa with 17 massage rooms. The rebranded Park Hyatt Siem Reap (formerly Hotel de la Paix) underwent extensive refurbishment and returned from Bill Bensly's design surgery 1 August, 2013 with an all new guest “experience.” The 108 rooms include 13 new-look suites (four of these with dip pools for a truly sybaritic sprinkle). Expect 34sq m of space and up with top suites weighing in at an elephant-swinging 242sq m. The living space offers gleaming timber flooring underfoot with whirring ceiling fans (all rooms are air-conditioned of course), a flat-screen television with DVD player, rich fabrics, lounging divans and Italian marble generously slathered all over the bathrooms. This address strives to do things differently. Angkor Wat is a central design theme. The easy-to-spot ficus tree in the garden came from the ancient Angkor Wat site (and this motif runs through much of the interior design) but the rest of the green space has been remodeled. The new spa comes with six treatment rooms, steam rooms, and all manner of wellness distraction. While studiously avoiding any Muscle MICE overtones, the hotel does cater for suits on the go with The Gallery - versatile event space for small corporate meetings and the like. All in, it fastidiously remains a Siem Reap boutique hotels choice despite the burden of a big international name. There is an alfresco free-form pool to burn off excess calories and a gym is on hand to get the job done faster, all-weather. The simply named, Dining Room serves Khmer cuisine with a dash of French. Check out the Glass House Cafe and the Living Room (bar and lounge). Those hoping to spend a little less on their dinner will appreciate the hotel’s central location opposite the colourful Central Market and a short walk from buzzing Pub Street. Located two kilometres from Siem Reap’s bustling town centre within the Salakomreuk Village Commune is Navutu Dreams Resort & Spa. Tucked into a corner at the end of a dusty road, Navutu’s entrance opens up to a spacious and simple lobby decorated with delicate wooden furniture and handcrafted wooden sculptures. Friendly staff will welcome you back to this delightful retreat with cold towels and drinks after a long day of temple exploration. Behind the lobby is where the real relaxing begins. Surrounded by lush rice fields, Navutu’s 1.5 hectare spread is perfectly manicured with palm trees and tropical flowers abloom. The resort's three pools will satisfy sun-seekers, water babies and health enthusiasts. There is an 18m freshwater lap pool and a saltwater family pool as well as a private saltwater lounge pool at the end of the property shielded by palm trees. Hidden in nooks and corners of the compound are hammocks for a quiet snooze or a good read. 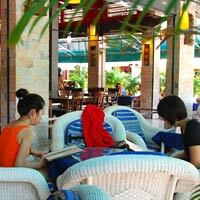 The resort also has an open lounge with spacious day beds and a selection of excellent reads right next to the lounge pool. Navutu serves up only villas. These are whitewashed with flat open roofs perfect for sunbathing. The architecture bears an uncanny resemblance to Santorini chic. Spa treatments are likely to top your agenda here and the resort offers wellness programmes that include detox, acupuncture and other ancient healing methods. The massage and spa menu includes traditional Khmer massage, invigorating Indian head massage, and a signature Queen Bee Facial using wild rice (for exfoliation), wild honey (as a mask), and a range of body scrubs and wraps. The resort also offers specialty wellness and yoga programmes. Also within the same commune is Sarai Resort, a 48-room Moroccan-inspired luxury boutique resort. The East meets West theme runs seamlessly right through, from fusion choices on the menu at Goat Tree Garden Restaurant to the unmistakable white-arched-windows of Morocco to the spa treatments at Seasons Spa, combining traditional Moroccan therapies with quality local ingredients. The floating sun-loungers dotting the alfresco saltwater pool with its geometric blue pattern add to the sense of surreal luxe. Low season rates starting at US$71 make this an attractive ensemble. If you're more inclined to do as the Romans and go local, in a nice way, try the newish Mane Boutique Hotel. This 18-room property is named after its owner, Mane, a Cambodian woman who wanted to leave behind a legacy of Cambodian hospitality for her children. 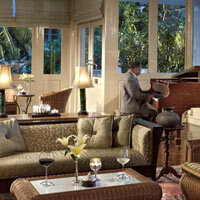 The hotel's interior is dotted with antiques, furniture and artwork from the family's personal collection. Along with the personalised décor you can expect service that is warm and genuine. Staying at Mane is like home-away-from-home. On cool evenings, grab a bike, offered free of charge by the hotel, and explore the surrounding rice fields. For something more exclusive, book an entire villa and bask in your own tropical sanctuary with an expansive saltwater pool at Villa Ni Say. This modern minimalist luxury villa comes with housekeeping staff, in-villa breakfast and a suite of bespoke activities to choose from. For US$850 a night during the low season and the rains (climbing to US$1,600 per night peak season), the villa can accommodate up to 12 people, ideal for small groups or families. In a different commune, even farther away from the main town (a 15-minute tuk tuk ride) is Bunwin Boutique Hotel. If you’re seeking a peaceful sanctuary away from the umbrella-waving tour groups and rib-bruising buffet breakfast scrums, consider this cool and charismatic hotel. It’s not the easiest place to find and in many ways that’s its biggest appeal. You’ll find the two-storey black and white villa hidden among a tangle of palm trees at the end of a dirt track off Road 6. Bunwin is a small and intimate property with eight spacious rooms and two suites gathered around a funky “black” swimming pool (dark tiles make the water look like ink). The design and layout of rooms and suites are almost identical but while the 42sq m rooms feel perfectly proportioned, the suites feel a little too big at 56sq m. A few more furnishings would make them cosier. Clean white walls, cool stone floors and dark wooden furnishings keep the modern decor simple yet attractive. The huge bed could sleep a bevy of heavenly nymphs, plus there’s a flatscreen TV, free WiFi, a small safe, hairdryer and tea and coffee facilities. There’s a surprisingly comfortable bath sunk into a stone ledge just off the living area and a pebble-edged walk-in rain shower in the bathroom. If you do choose to stay in a suite you’ll get a free massage (in-room or poolside), complimentary lunch or dinner in the hotel’s intimate restaurant, free airport transfers and use of a mobile phone with free local calls and a laptop. There’s also a free tuk tuk service to and from the city. What staff lack in English language skills they more than make up for in enthusiasm and friendliness. This is a great option for couples. The teak-explosion in the lobby of the Borei Angkor Resort and Spa is a rather overwhelming introduction to this 188-room hotel. Everything from the sweeping staircase and grand pillars to the ornate panelling and swivel bar stools is made from shiny hardwood. It’s a little OTT but compared with many of the other cookie-cutter Khmer-style hotels on Road 6 (the airport highway) – this ranks as one of the more impressive. Doormen in traditional costume will welcome you into the spacious lobby, which buzzes with the chatter of European tour groups who favour this hotel. Book to stay in the newer Landmark wing where rooms are more modern and spacious at 47sq m (the Deluxe rooms in the older wing are 40sq m). Unsurprisingly wood dominates the room decor but furnishings are tasteful with chunky beds and ornate headboards incorporating intricate gold motifs. Silk fabrics in mint hues complement the rich, red wood while wall hangings add personality. A balcony offers pool or city views while inside the room is equipped with TV, freestanding bath, separate walk-in shower, minibar, tea and coffee facilities and safe. There are also seven 65sq m Borei Suites. Or live like a king in the 188sq m Royal Suite, which has three balconies, a Jacuzzi, kitchen and private dining area. 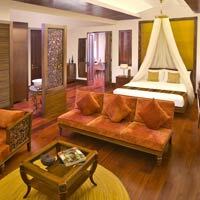 This is a family-friendly Siem Reap hotel that scores well. In contrasting style and next to the Royal Residence is the FCC Angkor, sister to the famed restaurant and hotel in Phnom Penh. Facing the river in the renovated mansion of a former French Governor, a huge bright bar and terraced restaurant has been created where diners can while away an afternoon or two, cooled by ceiling fans, looking out over the garden. There are chic art shops downstairs as well as the entrance to the popular Visaya Spa with the obligatory hot stones. Connected but hidden from the road are 29 rooms and two suites built in a bright white cubist style around a pool. The contemporary decor blends natural woods and fabrics with fresh magnolia walls while lime and mango cushions and striking artwork provide big bursts of fruity colour. The entire front wall of each room is a sliding glass door covered by a thick curtain. The rooms are quite dark when it’s drawn but be prepared to be on display if you pull it back. With the pool only a few steps away, you may have an audience as you wander around in your underwear. Rooms come with LCD flatscreen TVs, complimentary Internet access, safes and minibar. 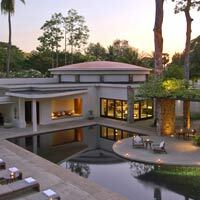 Down by the riverside, behind a crowd of shady palms, is La Residence d’Angkor, an Orient-Express property. Stroll across the wooden walkway over rippling fish ponds topped with pink lotus flowers and you’ll arrive in the dark-wood lobby kept cool and breezy by slatted shutters and old-fashioned ceiling fans. Traditional Khmer style is fused seamlessly with smooth contemporary design creating a modern hotel with strong cultural roots. Lush landscaped gardens and glistening pools create a serene environment by day while poolside fire pits, candles and lanterns make the property truly enchanting by night. Although centrally located, the surrounding wall of thick foliage blocks the sound of roaring tuk tuks, ensuring La Residence remains a haven of urban tranquillity. There are 54 rooms offering views of the pool, river or gardens. Decorated in cottons, silks, wood and bamboo, they have the feel of a luxury safari tent, with fold-down canvas blinds and mosquito nets over sprawling beds. Each 45sq m room has a private terrace and corner bath big enough to hose down a hippo. The eight suites are incredibly spacious at 100sq m and are located on the second floor in the quietest area of the property. The decor is more chic and understatedly cool with clean lines and dusky colour schemes. The bathroom is bigger than many hotel rooms and includes a freestanding bathtub, walk-in rain shower, twin basins and a dressing and storage area. Spray on your mossie repellent then head outside to the large terrace overlooking the gardens. Top-notch amenities include flatscreen TV, DVD, iPod docking station and free WiFi. The saltwater pool is the perfect place to plunge and unwind, or head to the elegant spa that uses local organic and chemical-free lotions and potions. There’s an enticing alfresco garden terrace where you can enjoy a meal while watching Khmer dance performances (Tuesdays, Thursdays and Saturdays from 8.30pm until 9.30pm) or a shadow puppet show (8pm on Fridays). Check out the well-stocked boutique shops in the lobby for last-minute presents such as spices boxes, ornate hair pins or silk scarves. If you’re coming by taxi be aware that many drivers still know the hotel by its former name, The Pansea. This is a high ranker on our Siem Reap hotels review. Sandwiched between the Royal Gardens and the Old Market Area is the newly refurbished Shinta Mani Resort. This stylish resort takes on a modern feel with chic white walls and black polished furnishing and a clever play of mirrors. Shinta Mani Resort plays hosts to a local weekend specialty market. Open every Saturday and Sunday 4pm-9pm, the local market is a wonderful venue for gift shopping, featuring local artisans, jewellery and intricate accessories all Cambodian-made. This small weekend market is known to local expats and tour buses are seldom seen. If you're not into shopping, this is still a great place to chill and enjoy the live music by indie singers over a glass of beer and sizzling sausages. If you're in the mood for a splurge, stay at the Shinta Mani Club, the exclusive sister property of the resort. With a heftier price tag, the upscale 39-room boutique hotel rivals the likes of Hyatt and the Le Meridien with its seamless service and perks like an open bar from 3pm-5pm with free flow of drinks, canapes and other gourmet snacks. Flying the Preferred Hotels' "boutique" banner, Anantara Angkor Resort & Spa (formerly The Sothea Luxury Boutique Resort) certainly has sparkle. Its 39 sumptuous suites are an essay in elegance and sophistication. Handcrafted wooden furniture and rich fabrics make this a touchy feely environment perfect for decadent lazing and wallpaper stroking. And you needn’t lift a finger – let the butler do it for you. Amenities include a 37-inch LCD TV, orthopaedic bed and lots of free stuff such as WiFi, laundry and non-alcoholic minibar. The intimate 48sq m Deluxe suites have balconies overlooking an attractive swimming pool and are soundproofed to ensure restful sleep – this is not a green light for an all-night karaoke party. Stay in the whopping 140sq m Sothea Suite and you’ll get your own private garden, library and in-suite spa equipped with a Jacuzzi and two massage beds. The somewhat out-of-town location on Route 6 can be a plus if you're scouting for quiet Angkor boutique resorts. One of the best Siem Reap resorts around and an unquestionably top-drawer address is the Amansara (once the guest villa of King Norodom Sihanouk) run by Amanresorts. It offers an understated, homey feel in a private garden compound with 24 suites finished in terrazzo and timber. It may be difficult to drag yourself off the bamboo loungers that rest beside the curved pool to visit the temples. Each suite has its own courtyard and there is a good indoor-outdoor fusion between the two. This is for a trifling US$750 or more a night. Or opt for one of the 12 Pool Suites where you can take a dip in private. The spa at Amansara offers holistic Khmer remedies, massage, reflexology, and a range of organic exotic scrubs (try peppermint). For food and wine aficionados, Amansara has a walk-in wine cellar and the Dining Room – previously the screening room of King Sihanouk with a dramatic seven-metre-high ceiling. Guests also have access to custom-fitted tuk tuks and their own private driver. If you dream of touring a temple all by yourself – first by moonlight and then again as the sun rises – try Amansara’s Ancient Angkor trip. It does mean a 4.30am wake-up call but it will be a morning you’ll never forget. It’s one of many excellent guided temple trips the hotel will arrange for you and the knowledgeable local guides will do their absolute best to make sure you beat the crowds using secret entrances and strategic timing. Or try one of the Amansara Experiences such as a helicopter trip across the jungle with up to four landings or have yourself spiritually cleansed by a monk. There’s a programme for kids too. 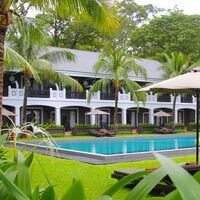 A charming Angkor boutique hotel option is the French-run Angkor Village Hotel with lotus ponds, banana trees, palm fronds and lush greenery in the heart of town. 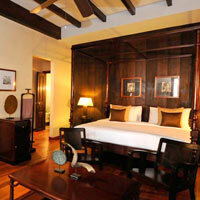 The rooms are decked out in tasteful traditional furniture with local arts and crafts on the walls. They vary in size and decor but all have a warm and comfortable atmosphere. There are safes in most rooms but no televisions. Watch passing frogs instead. The hotel has its own Apsara theatre-restaurant for classical dance and music performances. It is reckoned to be the most authentic venue in Siem Reap because you don’t eat during the performance. Located out of town on the edge of Angkor Archaeological Park, is Angkor Village Hotel’s sister property Angkor Village Resort & Spa. Think tropical oasis and you’ve got this place down to a tee. In many countries this would be considered a botanical garden. Thankfully you don’t need a ticket to enter just follow the butterflies past the frothing fountains and into the open-air lobby. Once under the shade of the towering palms, breathe in the lemongrass-scented air and pinch yourself hard to make sure you’ve not been sucked into one of David Attenborough’s cinematic musings. The wooden Khmer architecture blends harmoniously with the four hectares of landscaped gardens and the resort’s 20 bungalows are well hidden among the trees. There are 80 rooms in total on either the ground or first floor. Each one looks over the leafy grounds and the 250m "river" pool that snakes through the property. Rooms are light and spacious at 40sq m and have the rustic charm of a country cottage. Romantics will appreciate the wooden four-poster beds and large corner baths while those less keen to abandon home comforts will enjoy the LCD TVs and WiFi Internet. All rooms have balconies or terraces. The resort’s Spa Village offers an array of treatments from massages and facials to herbal body wraps. If you want to avoid the chattering tour groups and crave a more intimate experience, try one of the smaller Siem Reap boutique hotels. They may be smaller but not necessarily cheaper. Pavillon d’Orient Hotel is a boutique property that opened in January 2008 with 18 art deco rooms housed in two French colonial-style mansions on the road to Angkor – it’s one of the hotels closer to the temple complex. Each room has its own balcony overlooking tropical gardens and a pool. In-room features include plasma TVs, WiFi, aircon as well as ceiling fans, safes, and mosquito-net-draped beds. Guests are free to use the computers in the lobby if e-mail calls. There’s an open-air restaurant serving Cambodian and European fare. Pavillon d’Orient’s sister property Pavillon Indochine is also relatively small with 20 rooms including family suites that sleep four people. Pavillon Indochine also has a pool, and an open-air restaurant. 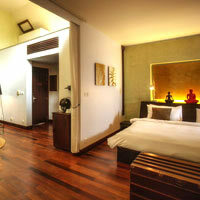 A short drive from Siem Reap, and walking distance from Wat Athvea temple, is Sojourn Boutique Villas. Nestled among rice paddies and palm trees in Treak Village, it has 10 rooms all with pool and garden views. Stay in the Temple Villa and shampoo your hair under the stars in the outdoor shower or chill out in the roof garden of the Sojourn Terrace Room. There’s free Wireless Internet throughout the property, a saltwater pool and swim-up bar and daily cooking classes. Hidden away in “The Passage,” a narrow alley packed with bars, cafes and boutique shops selling arts and crafts, is Hotel Be Angkor. With only three rooms, all themed around different local artists, you’re guaranteed a very personal stay. Choose from the spicy Saffron Room, the sculpted Bamboo Room or the haunting Sepia Room. Taking the boutique concept to its limit is Hotel Be Angkor’s sister property The One Hotel Angkor, which has, you guessed it, only one suite. Expect to be pampered to within an inch of your life with private chefs serving meals to your room and spa therapists knocking on your door. On arrival you’ll be loaned an iBook, iPod and mobile phone with local sim card. The indoor-outdoor sound system allows you to accompany a romantic late evening dip in your Jacuzzi with your favourite tunes. The hotel is also located in The Passage and facilities include a 32-inch LCD TV, Wireless Internet, rooftop terrace, outdoor shower and an army of staff at your beck and call. The Rambutan Resort (formerly the Golden Banana Boutique Resort) is a gay-friendly property with bags of personality and a lively buzz. It’s a cool and funky place with mix-and-match decor, hanging egg chairs and squishy floor cushions. The villas consist of two floors, the lower with bed and bathroom, the upper with living room and outdoor balcony, while suites have balconies and alfresco stone baths. The hotel and resort are two separate properties opposite each other and both have swimming pools. The resort’s poolside bar can get a little boisterous in the evenings while the hotel tends to me more sedate. Golden Banana also runs a cheap and cheerful bed and breakfast around the corner for those in search of a clean Siem Reap budget hotel. Other smaller Siem Reap boutique hotels with big personalities include the newly jazzed up Suorkear Villa formerly known as Villa Kiara, La Maison D’Angkor, The Kool Hotel, the Golden Temple Hotel and Resort and its newer more exclusive edition, the Golden Temple Residence. Correspondent Stuart Wolfendale argues most local properties adhere to the style of "Thai wat roof over French colonial, which occasionally makes you wonder whether you are passing a general post office." He comments that some have a façade of newly dried plaster and anti-reflecting glass that hint at a provincial Chinese city. Dozen of the genre, targeting tour groups, are going up in both directions along Road 6. Still, they are modestly priced hotels and if you’re not that picky, they can be quite satisfactory places to stay. Examples are the City Royal Hotel, which has that civic building look and the small and basic Angkoriana on the Angkor Road. Also in this genre are the older and traditional Ta Prohm Hotel, Princess Angkor Hotel and the large and modern Angkor Century Hotel. 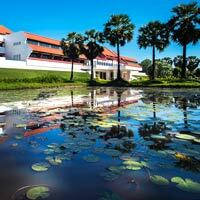 Angkor Palace Resort and Spa, Siem Reap is set in 11 garden hectares, 20 minutes from the Angkor temples. Rooms are spacious and well appointed offering comfort and style, along with satellite TVs, complimentary Internet access, tea and coffee facilities, safes and minibar. There is the resort's Kainnora Spa on hand should you wish to indulge in some therapeutic treatments after a long day's sightseeing. If sporting action is more your thing, there’s a pool, a gym, and tennis courts. The hotel's ballroom can hold 200 people theatre style making it a useful Angkor meeting venue. Also find a golf range. 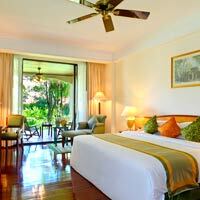 The clean and friendly Apsara Angkor Hotel is a good choice. It has been running since 2002 with rooms kitted out with natural wood floor, lavish Cambodian silk, a laptop-size in-room safe, satellite TV and Wireless (and plug-in) Internet access. It showcases immense carved Khmer furniture. 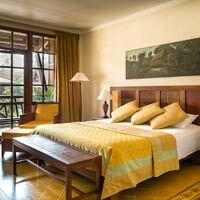 Its superior rooms with a pool view are particularly pleasant with shuttered French windows looking onto a balcony. The pool is big enough for Angkor’s bid for the Olympics. Prum Bayon Hotel is another option on the airport road, reports Wolfendale. Steep discounts are offered during low season. The 74 rooms are clean, basic and equipped with TV, minibar, aircon, IDD, and safe. The hotel has meeting and conference facilities as well as a pool, small fitness centre, and one restaurant. The 2014 refurbished, locally-owned four-star New Angkorland Hotel is a four-storey property with 70 rooms located in a leafy street near the downtown area. Rooms have Khmer art on the walls, and also offer cable TV, Internet access, aircon, minibar, safe, and tea-and-coffee making facilities. There is an outdoor pool and Jacuzzi, business centre, restaurant and fitness centre. You may hear the tinkling of ivories as you step into Prince D' Angkor Hotel & Spa, which has a cosy piano bar tucked in the corner of its Khmer-style lobby. After a spot of toe-tapping head off to one of 200-plus rooms, which are pleasantly decorated in a no-frills kind of way. Superior rooms are 38sq m and offer city views while the Deluxe are 40sq m and have balconies and DVD players. All rooms include TV, minibar, safe, aircon, IDD, and tea and coffee facilities. A sound choice for those seeking a mid-range, Khmer-style city centre hotel. About 10 minutes' south of the Angkor temple park is the small and welcoming eight-room, two-storey Resort La Villa Loti, decked out in simple Khmer style and run by friendly Dutch owners. Rooms offer ceiling fans (and air-conditioning), private bathrooms with hot water, toiletries, coffee and tea-making facilities and complimentary WiFi. Expect a restaurant with both Khmer and Western dishes and a small sun-drenched pool for an apres-temple soak with a cool smoothie in hand. Later, try out some on-site spa treatments. If you are looking for one of the abounding guests houses in Siem Reap town, get hold of a copy of Pocket Cambodia Guide for Siem Reap, which is a giveaway everywhere. A few examples are worth a mention here. The Red Piano alas has mutated from bar and inn to a snazzy restaurant, but the yellow facade Auberge Mont Royal d'Angkor remains a cosy guest house with rooms starting at around US$30 or lower, and cheesy but welcoming 'kissing' swans on the beds done up in towel rolls. Give temple-weary legs a rest and head to one of Siem Reap’s three golf courses. The 18-hole Phokeethra Country Club (www.phokeethragolf.com) is managed by Sofitel Phokeethra Royal Angkor Golf and Spa Resort and is located 20 minutes from the airport. It holds the annual Cambodian Open tournament every December. The 18-hole Angkor Golf Resort (www.angkor-golf.com) was designed by Nick Faldo while the Korean-owned Siem Reap Lake Booyoung Country Club is the largest with 27 holes. Siem Reap's famous Angkor Night Market (www.angkornightmarket.com) recently had a facelift and now the entrance to the market is adorned with colourful fairy lights and thatched roof stalls neatly line the compound. You’re likely to find the biggest crowd at the spruced up Island Bar – a Balinese-style beach hut with a thatched-roof selling fruity cocktails and spicy snacks. Expect to find souvenirs from the typical "I love Cambodia" t-shirts to bamboo handbags to silk scarves. There is also an array of Cambodian titbits and spices and a selection of home decor items such as stone Buddha carvings and heavy wooden sculptures. 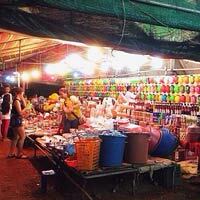 When shopping at the night market, be prepared to haggle and make your opening bid at least half the asking price. The market opens from 4pm till late, although the later you go, the livelier it will be. It’s also worth exploring the Old Market and Central Market, which are open during the day and sell more of them same souvenirs and curios. Looking for more refined souvenirs? Head to Artisans Angkor (www.artisansdangkor.com), a large courtyard garden surrounded by workshops. Watch local artisans chisel and sand down huge Buddha sculptures, melt silver and hammer it into delicate ornaments, and marvel at lacquer application. The adjacent boutique showcases the finished artwork including multi-hued silk purses and dresses, wood and stone sculptures, and Khmer-inspired homeware. Scores of local designers and artists have small and highly tempting boutiques in The Passage (which continues as Alley West), a narrow lane sandwiched between Pub Street and Street 9. Prices are more expensive but still very reasonable considering you’re often buying bespoke jewellery, clothing, handicraft and art. Shops to watch out for include Bambou Indochine, Wild Poppy, Poetry, Smateria, Garden of Desire, Wanderlust and Circle Boutique. Ensure your holiday leaves an indelible, if memorable, mark by heading to Angkor Tattoo (www.angkortattoo.com), perhaps the only trusted place in Siem Reap for inking the skin. There are more great boutique shops beneath FCC including Tiger Lily, Orange River and WA Gallery. Siem Reap-based American photographer John McDermott has several galleries selling moody black and white photos of Angkor Wat. A good option if you discover your thumb making a guest appearance in your own photographic endeavours. Settle down for some pampering after exploring the temples and hours of shopping. Siem Reap has dozens of massage parlours to choose from. If you want to avoid the hanky-panky, then opt for more established names like Frangipani Spa, Bodia Spa, Kaya Spa and Sokkhak Spa, all located within the Old Market Area, and avoid massage parlours set up on the street near the Night Market area offering 30-minute rubdowns for US$1. Body & Soul Spa offers massage classes for those eager to learn the art of Khmer massage and reflexology. There are several floating villages that are worth visiting and this can be easily arranged with a day trip. Beyond Unique Escapes (www.beyonduniqueescapes.com) runs a well-organised and informative full-day tour including a boat trip through a flooded mangrove forest and a stop at a local market. Stroll around and see makeshift hairdressers, illegal petrol stalls and women selling snakes. Chong Khneas is the closest floating village from the river edge and most accessible. This is also the meeting dock for boats departing to Phnom Penh. Visit Kampong Phluk if you're up for an adventure, and a slightly off-the-beaten track experience. Meander through ghostly mangrove trees and watch friendly long-tailed macaques swing by. And then there is Kampong Khleang, the farthest floating village with towering stilted wooden houses raised 10m from the ground. If you choose to go independently, you can easily hire a tuk tuk that will bring you straight to the jetty at Chong Khneas and from there, you can negotiate your route and fee with the local boatman. Depending on which floating village you choose, be prepared to pay between US$20-$25 per person. Side trips to visit local communities and savour local food can also be arranged. Every Saturday night, Dr Beat Richner plays haunting cello music and talks about the health crisis in Cambodia. The Swiss paediatrician has opened four non-profit children’s hospital in the country including tonight’s venue. It may sound a little odd but it’s powerful stuff and not to be missed. The performance is called Beatocello (www.beat-richner.ch) and takes place at 7.15pm at Jayavarman XII Hospital. Explore the Cambodian countryside like a local on your very own 125cc scooter with Khmer Ways (khmerways.com). You can drive yourself or ride on the back with a friend as you follow your guide along dusty paths dodging water buffaloes and chickens. Beat the crowds at the main Angkor Wat complex and explore Bakong temple and Rolous temple or wander through narrow alleys in Cambodia's countryside with Grasshopper Adventures (www.grasshopperadventures.com) bicycle tours. You can barely move in Siem Reap without tripping over an apsara dancer or shadow puppeteer. Most hotels stage shows with dinner. One of the best shows takes place nightly at the Apsara Theatre (www.angkorvillage.com) – an atmospheric wat-style wooden pavilion. For a free shadow puppet show head to the Night Market. Visit the Angkor National Museum (www.angkornationalmuseum.com) then wow your temple guide with your knowledge of the Khmer empire. Perhaps he’ll tip you? There’s also a Landmine Museum where you can deactivate fake mines but it’s about 40 minutes away by car. A little closer is the War Museum, which has rusty tanks and an old Russian helicopter. For breathtaking aerial views over Angkor Wat and the sprawling jungle hop on a chopper with Helicopters Cambodia Ltd (www.helicopterscambodia.com), a New Zealand company with Kiwi pilots. If you prefer your sightseeing slow and steady then take an elephant ride (www.angkorvillage.com) to the top of Phnom Bakheng at sunset or have a Jungle Book moment as you plod past gangs of monkeys at Bayon temple. Watch the sun set over the paddy fields from the back of a quad bike during a one-hour tour with Adventure Cambodia ( www.quad-adventure-cambodia.com). Nestled in the lush rainforest not far from Angkor Wat, is the Flight of the Gibbon (www.treetopasia.com), a circuit of adventure activities that will challenge your fear of heights, or lack thereof. Be prepared to zipline from tree to tree, abseil, and walk on vertiginous sky bridges. If you're lucky, you may get a chance to spot wild gibbons in the protected ecosystem. Spend an evening at Road 60 where the locals hang out. You cannot miss it once you hit the road, lined with straw mats, food vendors and bright theme park spotlights. Sink your teeth into Cambodian BBQ, street-style – skewered meat, chicken on bamboo sticks and grilled fish served with a side of raw vegetables and spicy fried ants. Then head over to the mini theme park and join in the fun on a rickety rollercoaster and bumper cars. Pay a minimum of US$1 and shoot some darts or knock over empty tin cans at the carnival booths lined up along the street. If you have children, there are bouncy castles and merry-go-rounds to please everyone. Find an English-speaking tuk tuk driver to bring you there and to help with food orders. Expect to pay around US$5-$8 return. 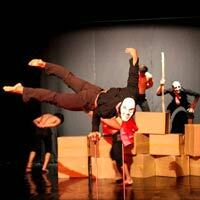 You won't want to miss the highly sought after Phare - The Cambodian Circus (www.pharecambodiancircus.org). The hour of high-energy juggling, cartwheels, acrobatics, and contortions, all following a Cambodian storyline, will leave you wanting more. The show is accompanied by live music played on traditional instruments. This is a true celebration of Cambodian art and culture. Set up in 1994, Phare Ponleu Selpak is a testament to the resilience of the Cambodian people. Eight Cambodians who had endured the harsh refugee camps after the fall of the Pol Pot regime decided that expressive art would be an effective therapy to heal those recovering from the atrocities of war and deprivation. Started as a therapy centre, the NGO now has schools for music, art, theatre and circus. There are daily shows starting at 8pm and ticket prices are US$18 for adults and US$10 for children. Get into the mind of Jack Travis the famous archaeologist and adventurer and solve a string of mysteries before you're given the key to unlock the door to freedom. The Great Escape (www.greatescapecambodia.com) is a latest craze to hit Siem Reap where participants, often in small groups, have to solve riddles and cryptic messages in 60 minutes in order to escape from the room. As the cities re-established themselves in Cambodia after 1979, so did French food, frequently under the control of Frenchmen, and Siem Reap is notable for this with several French-influenced restaurants. Some of the best French dining is to be found in hotels of course, notably Le Bistrot de Siem Reap in the Victoria Angkor (tel: [855-63] 760-428). Keep your ears to the ground and French expats will point you to L'Annexe Restaurant (tel:  95-839-745) offering a simple but ever-changing menu. A must try is the "flammekuch" an Alsatian-style melt-in-your-mouth pie filled with crème fraîche, caramelised onions and smoked lardons. Olive Cuisine de Saison (tel: [855-63] 769-899) is the new kid on the block and has caught the attention of many. Located close to the Old Market Area and Pub Street, this is a definite go-to for warm, hearty, French favourites. The nearby Le Malraux (www.le-malraux-siem-reap.com) is a good place to sip wine and people watch out on the open terrace before tucking into a delicious meal. Two interesting establishments found close to each other on Sivatha Street mixing French with other cuisines are Café Indochine (tel:  1280-4952), and Carnets d’Asie (tel:  1676-4701), a bookstore, gallery and tea shop all in one. 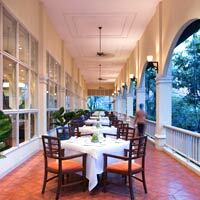 Café Indochine is part of the Pavillon Hotel family. Chez Sophea & Matthieu (tel:  1285-8003) serves up French and Khmer cuisine opposite Angkor Wat. There are as many cuisines in Siem Reap as there are visiting nationalities – expect Thai, Korean, burgers and chips, and heaps of Japanese. The other nosh that is well worth seeking out is Khmer food. It does distinguish itself from Thai cuisine by a force of flavour and a certain smokiness, which can have a surprising appeal. A good place to start is Angkor Palm (www.angkorpalm.com) in the Old Market area, which serves a generous and delicious Khmer taster platter including local favourites such as fish amok, Cambodian chicken curry and tangy mango salad. The true scents and flavours of Khmer cooking can also be found at the vibrant Khmer Kitchen (www.khmerkitchens.com). Mahob Khmer Cuisine (tel: [855-63] 966-986) not only serves a sumptuous selection of Khmer favourites but also selections of meats grilled at the table on hot volcanic stones. Sugar Palm (tel: [855-63] 964-838) is also a trusty option for Khmer food, located on Taphul Road in a wooden house with a balcony. Another is Viroth’s (tel:  1282-6346), a minimalist but stylish place, which is highly thought of. For a fine dining fusion of Asian, Cambodian and French food served in a traditional Khmer house, or outside on the garden terrace, try the impressive Abacus (www.cafeabacus.com). For alfresco dining on cushioned beds, head to trendy bar and restaurant Nest, just along from the Park Hyatt Siem Reap. It serves global and local dishes with a contemporary twist. Cuisine Wat Damnak (www.cuisinewatdamnak.com) is a treat for those who enjoy fine dining with a touch of molecular gastronomy. Chef Joannès Rivière meticulously designs a new degustation menu every week combining the best Asian ingredients such as edible flowers and unique critters, while employing steadfastly French techniques. If you're not already wilting under the Cambodian sun, then spice it up at one of the many Indian restaurants where you’ll be breaking a sweat after a meal of roti, biryaniand curry. The Indian (tel:  17-928-471) serves a selection of north and south Indian food. But before you bury your head in the menu, we’d suggest you try the creamy butter chicken and palak paneer (cottage cheese with spinach). On the same road - 2 Thnou Road - just opposite the Provincial Hospital is Dakshin's Restaurant (tel:  12-808-011) a cosy, family-run restaurant that is perhaps the only Indian restaurant in Siem Reap to have its own tandoor oven. Needless to say, the naans are extra fluffy and the tandoori chicken is a cut above the rest. Ready to curl up with a book or get your caffeine hit? Head to the sociable Common Grounds (tel: [855-63] 965-687) where you will see expats and locals mingling happily together. For a quieter, more secluded option, the New Leaf Book Café (tel: [855-63] 766-016) is a great place to lounge and read. A classier café is The Glass House (tel: [855-63] 211-234) at the Park Hyatt Siem Reap, with leather-bound chairs and decadent ice cream and pastries fit for a sumptuous – if not virtuous – tea. Responsible tourism is a growing trend in Siem Reap and many F&B training schools and social enterprises have popped up. Feel good about your meal as you give back at Green Star Restaurant (www.greenstarrestaurant.org) where a portion of your spending goes to its Green Gecko project that helps keep children off the streets, and in school. Also give Haven (www.havencambodia.com) a try, although you will need to book ahead if you're planning on dinner, as this place is generally abuzz. Those working at Haven have been given shelter and are being educated and groomed for better jobs. For a French twist, the Paul Dubrule culinary school (www.ecolepauldubrule.org) has two restaurants. Le Jardin Des Delices opens for lunch from Tuesday to Friday serving Khmer and Western dishes cooked by students. In the French Cultural Centre in the Watbo area is Le Cafe, an ideal place to unwind and savour delicate pastries made by the school's pastry students. The latest one-stop upscale food village with 15 cafes, restaurants and bars to choose from is King's Road Angkor (www.kingsroadangkor.com). Some notables are; Chez M.Paul (tel: [855-63] 866-340) for French flair, Hard Rock Café Angkor (tel:  935-656-55) and The Grey Khmer Grill (tel: [855-63] 866-940). Of bars and nightlife, it must be said that there is plenty but also that Siem Reap does go to bed early and, if you have been clambering over Angkor, so will you. The centre for Siem Reap bars is in the Old Market area next to the French Quarter and it focuses on a street near Sivatha Street (called Pub Street) because nobody knows what else to call it. There are about fifteen to twenty bars around it. At one end is Molly Malone’s, an Irish place with Guinness, a dart board and pool table, and then comes The Balcony while across the street is In Touch with a huge bar and good Thai food. The iconic bar Red Piano is just off the street with ochre walls, live music and a heaving expatriate crowd by mid evening. 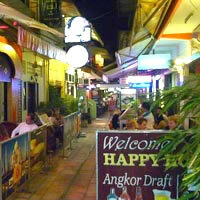 Up the street is the Temple Bar with Angkor décor and the Angkor What? – the first bar in the area. It is proud of its accumulated graffiti. For a taste of vintage Shanghai and the best cocktails in town, head to Miss Wong (tel:  9242-8332). Under the seductive glow of cherry-red lanterns, sip a lemongrass Tom Collins and chat with friendly Kiwi owner Dean Williams. This little gem is hidden away in The Lane (behind Pub Street) and is a gay-friendly establishment. A drink at the FCC (www.fcccambodia.com/angkor/) is also a must. Go between 5pm and 7pm for half-price happy hour drinks. Not too far off is Siem Reap's first micro-brewery, Siem Reap Brewpub (www.siemreapbrewpub.asia) with a range of fine beers produced in-house. Then there is Asana Old Wooden House (www.asana-cambodia.com), a quaint place for a drink in a traditional Khmer house. It serves locally inspired Khmer cocktails and even offers classes on these concoctions. There are dozens of cafes, restaurants and bars tucked away in narrows lanes running parallel to Pub Street. The busiest is The Passage, which continues into Alley West, and includes popular hangouts such as Amok Khmer restaurant (tel: [855-63] 965-407), AHA wine bar (tel: [855-63] 965-501), Cambodian BBQ (tel: [855-63] 966-052), Champey (tel: 964-713 and Chamkar Vegetarian Restaurant (tel: 92-733-150). Also worth exploring is The Lane – home to Little Pari (tel:  1250-5248), Japanese bar Nakamura (tel: 1280-3914) and il Forno (tel: 78-208-174), one of the best Italian restaurants in town with its own wood-fire oven. Don a grass skirt and lei and head to The Island Bar (www.angkornightmarket.com), a beach hut-style drinking hole in the middle of the Night Market. The Elephant Bar at The Raffles is a popular watering hole while at the opposite end of the spectrum, the Sok San Palace is a mad restaurant-disco-massage-parlour-karaoke that is high camp and a tad naughty. Close by is the dimly-lit Zanzybar disco. The other local disco is Martini, across the river, though "disco" is perhaps a rather grand word. Grab a beer and pull up a plastic chair. An upscale massage can be had at Japanese-run Chai Angkor, opposite the Sofitel (tel: 761-169), one hour, US$20. For gays, the recommended place is the Linga Bar and Restaurant (tel:  1224-6912 or www.lingabar.com) near Pub Street, which is proud of its cocktails and tapas. There is also a spa ‘for men, by men’. And that's our Angkor fun guide from A to Z, with a detailed Siem Reap hotels review for all budgets from heritage resorts to boutique inns and guest houses. Just remember to say, "Bonjour." Best travel season: November to June is the dry "winter" season. This is the best time to visit. The monsoons last from July to October. The mercury rarely climbs beyond 35 degrees Celsius in summer and in winter months the evenings could touch a cool 20 degrees Celsius. Temple passes are sold for US$20 (one day), $40 (three days – although they don’t have to be consecutive) and $60 (one week). If you purchase your temple pass for the next day at 5pm in the evening, you can go in to see the sunset for free. Just be sure that officials don't stamp your pass. Show them the date if they ask. Your pass should only be stamped the next day. Passes can be purchased at the tollbooth at the park entrance just outside Siem Reap. The park is open from 5am till sundown (around 6.30pm). If you’re caught at a temple without a pass you will be fined US$100. Guide books: Pick up the excellent and informative Siem Reap Angkor Visitor's Guide by Kenneth Cramer at a hotel. From Monument Books (FCC or the airport) pick up a fascinating 13th Century account, The Customs of Cambodia by Chinese traveller Zhou Daguan. More information at Tourism Cambodia (www.facebook.com and www.tourismcambodia.com/). The exchange rate for Cambodian riels is roughly US$1=KHR4,080. Room prices are very flexible. Hotels may offer steep discounts regardless of published or "rack" rates. Many hotels include breakfast, airport transfers and Internet access in the rates. A couple of properties also include free transport around the Angkor temples in a tuk tuk. International calls can cost up to US$7 a minute. Keep your mobile phone off. For extra high thread-count linen luxury stays, be prepared to fork out between US$750-$1,000, five-star hotels start at US$300 and boutique hotels are priced between US$70-$150. If you’re just looking for a clean bed and a safe place to stay, local guesthouses offer beds at US$10-$20 a night. Amansara. Tel: [855-63] 760-333, fax: 760-335, (e-mail: amansara@amanresorts.com or www.amanresorts.com). Angkoriana. Tel: [855-63] 760-274, fax: 964-349, (e-mail: info@angkorianahotel.com or www.angkorianahotel.com). Angkor Century Hotel. Tel: [855-63] 963-777, fax: 963-789, (e-mail: info@angkorcentury.com or www.angkorcentury.com). Angkor Palace Resort & Spa. Tel: [855-63] 760-511, fax: 760-512, (e-mail: info@angkorpalaceresort.com or www.angkorpalaceresort.com). Angkor Village Hotel. Tel: [855-63] 963-361, fax: 963-363, (e-mail: welcome@angkorvillage.comor www.angkorvillage.com). Angkor Village Resort & Spa. Tel: [855-63] 963-361, fax: 963-363, (e-mail: welcome@angkorvillage.comor www.angkorvillage.com). Apsara Angkor Hotel. Tel: [855-63] 964-999, fax: [855-63] 964-567, (e-mail:hotel@apsaraangkor.com or www.apsaraangkor.com). Auberge Mont Royal d'Angkor. Tel: [855-63] 964-044, fax: 964-528, (e-mail: contact@auberge-mont-royal.com or www.auberge-mont-royal.com). Borei Angkor Resort and Spa. Tel: [855-63] 964-406, fax: 963-436, (e-mail: info@boreiangkor.com or www.boreiangkor.com). Bunwin Boutique. Tel: [855-63] 969-158, fax: 969-159, (e-mail: reservation@bunwinboutique.com or www.bunwinboutique.com). City Royal Hotel. Tel: [855-63] 760-636, fax: 760-641, (e-mail: crh@cityroyalhotel.com or www.cityroyalhotel.com). FCC Angkor Hotel. Tel: [855-63] 760-280, fax: 760-281, (e-mail: angkor@fcchotels.com or www.fcccambodia.com/angkor/). Golden Banana Bed and Breakfast. Tel:  1288-5366, (e-mail: goldenbanana1@gmail.com or www.golden-banana.com). Golden Temple Hotel. Tel:  1275-6655, (e-mail: reservation@goldentemplehotel.com or www.goldentemplehotel.com). Golden Temple Residence. Tel:  212-222, fax: 761 222, (e-mail: info@goldentempleresidence.com or www.goldentempleresidence.com). Golden Temple Villas. Tel:  1294-3459, (e-mail: info@goldentemplevilla.com or www.goldentemplevilla.com). Heritage Suites Hotel. Tel: [855-63] 969-100, fax: 969-103, (e-mail: info@heritagesuiteshotel.com or www.heritagesuiteshotel.com). Hotel Be Angkor. Tel:  1275-5311, (e-mail: 2be@hotelbeangkor.com or www.hotelbeangkor.com). La Maison D’Angkor. Tel: [855-63] 965-045, fax: 964-966, (e-mail: info@lamaisondangkor.com orwww.lamaisondangkor.com). La Residence d’Angkor. Tel: [855-63] 963-390, fax: 963-391, (e-mail: info.rda@belmond.com or www.residencedangkor.com). 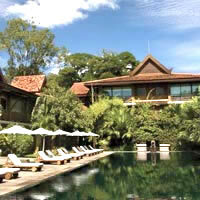 Le Meridien Angkor. Tel. [855-63] 963-900, fax: 963-901, (e-mail: reservations.angkor@lemeridien.com or www.lemeridienangkor.com/). Mane Boutique Hotel. Tel: [855-63] 768-899, fax: 761-333, (e-mail: info@maneboutiquehotel.com or www.manehotel.com). Navutu Dreams Resort & Spa. Tel: [855-63] 964-864, (e-mail: reservations@navutudreams.com or www.navutudreams.com). New Angkorland Hotel. Tel: [855-63] 760-544, fax: 760-547, (e-mail: info@newangkorlandhotel.com or www.newangkorlandhotel.com). Park Hyatt Siem Reap. Tel: [855-63] 211-234, fax: 966-001, (e-mail: siemreap.park@hyatt.com or siemreap.park.hyatt.com). Pavillon d’Orient. Tel:  9865-5738, (e-mail: mail@pavillon-orient-hotel.com or www.pavillon-orient-hotel.com). Pavillon Indochine Hotel. Tel:  1254-1003, (e-mail: mail@pavillon-indochine.com or www.pavillon-indochine.com). Prince D' Angkor Hotel & Spa. Tel: [855-63] 763-888, fax: 963-334, (e-mail:info@princedangkor.com or www.princedangkor.com). Princess Angkor Hotel. Tel: [855-63] 963-663, fax: 963-668, (e-mail: info@princessangkorhotel.com or www.princessangkorhotel.com). Prum Bayon Hotel. Tel: [855-63] 963-568, fax: 963-519, (e-mail:reservation@prumbayonhotel.com or www.prumbayonhotel.com). Raffles Grand Hotel d'Angkor. Tel: [855-63] 963-888, fax: 963-168, (e-mail: siemreap@raffles.com or www.raffles.com/siem-reap). Rambutan Resort. Tel:  1265-4638, fax: 964-008, (e-mail: bookings@rambutansr.com or www.rambutanhotelsr.com). Resort La Villa Loti. Tel: [855-63] 963-879, (e-mail: info@resortlavillaloti.com or www.resortlavillaloti.com/en/). Sarai Resort. Tel: [855-63] 962-200, fax: 962-201, (e-mail: info@sarairesort.com or www.sarairesort.com). Shinta Mani Resort and Shinta Mani Club. Tel: [855-63] 761-998, fax: 761-99, (www.shintamani.com). 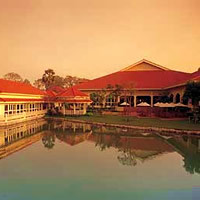 Sofitel Angkor Phokeethra Golf & Spa Resort. Tel: [855-63] 964-600, fax: 964-611, (e-mail: h3123@sofitel.com or www.sofitel.com). Sojourn Boutique Villas. Tel:  1292-3437, (e-mail: info@sojournsiemreap.com or www.sojournsiemreap.com). Sokha Angkor Resort, Siem Reap. Tel: [855-63] 969-999, fax: 969-998, (e-mail: reservations.sr@sokhahotels.com or www.sokhahotels.com). The Kool Hotel. Tel: [855-63] 969-690, fax: 964-795, (e-mail: info@koolhotel.com). The One Hotel Angkor. Tel: [855-63] 755-311, (e-mail: youaretheone@theonehotelangkor.com or www.theonehotelangkor.com). The Samar Villas & Spa Resort. Tel: [855-63] 762-449, (e-mail: resa@samarvillas.com or www.samarvillas.com). Ta Prohm Hotel. Tel: [855-63] 760-087, fax: 963-528, (e-mail: info@taprohmhotel.com or www.taprohmhotel.com). Victoria Angkor Resort & Spa. Tel: [855-63] 760-428, fax: 760-350, (e-mail: reservation@victoriahotel.asia or www.victoriahotels.asia). Villa Ni Say. Tel:  012-364-662, (e-mail: info@villanisay.com or www.villanisay.com).